Complete your cold weather attire with the Cod fold over beanie from Roark. 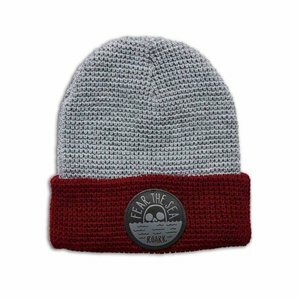 Featuring a waffle knit construction with light grey dome and burgundy red cuff, this beanie is finished off with a black and grey "Fear The Sea" patch at the cuff. Cod Copper Fold Beanie from Roark. Black and grey Roark patch on cuff.